To many Americans with very mixed backgrounds, the passage of time has resulted in a gradual erosion of the particular traditions that had been inherited... Customs, language, manners and folkways of their forebears. For some the heritage has been completely erased in the process of being absorbed into a mainstream American culture. In some cases, however, there is a renewed interest in one's origins, prompting a seeking out of the old ways and traditions that have long been forgotten or ignored. There are even those that have a deep fascination with ancient traditions. It is with these persons in mind that these pages are presented. It may offer a glimpse into a way of life that, but for a quirk of fate, might have been their own. 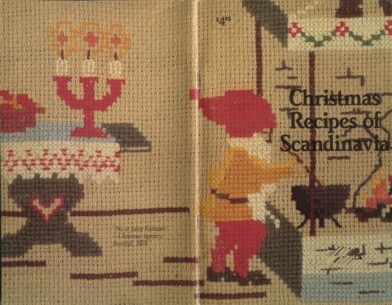 It does not, by any means, contain every tradition or or every dish or recipe that might possibly be found on a Scandinavian holiday table, rather it is a sampling of the best-loved holiday fare of Norway, Sweden, Denmark and Finland. There are notes on the traditional Christmas customs of Scandinavia, in the hope that the rediscovery of a part of your heritage may enrich and add to the joy of your holiday season.